Dungeons and Dragons, the original dice-based fantasy role-playing game, was coming into its own around the time I was hitting puberty. I hadn’t really paid it much attention until invited to the home of a classmate to play the game. For those unacquainted, D&D is an interactive version of Lord of the Rings, where a group of individuals with self-selected character types (wizard, thief, warrior, etc.) enters a castle, dungeon, etc., encounters strange, beautiful, or grotesque people/creatures, and seeks to obtain treasures or achieve a quest of some kind. The Dungeon Master (DM) talks the group through what they’re seeing as a narrator, and the individuals, via their characters, respond aloud to the described environment. Sometimes they try to fight something; sometimes they try to steal something; sometimes they try to commit sins of a sexual nature (we’re talking adolescent boys–it’s gonna happen). 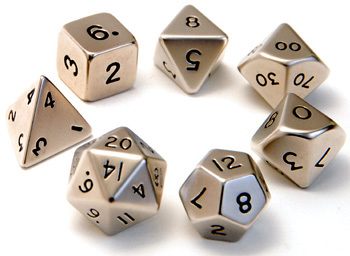 The DM rolls one of several multi-sided dice to determine the likelihood of the character succeeding, and play continues. Once it was explained to me, I figured I could play along. I was wrong. D&D is primarily a collaborative storytelling activity. By age 10–my first exposure to the game–I was already writing stories of my own. Storytelling, for me, was a solitary activity. D&D took too long for me. I was and still am a bit impatient with people. The group needs to get somewhere, and every individual wants to throw in their two cents about where to go and what to do. Mind you, that’s reality. I understand that. And good storytelling has characters with differing viewpoints. However, the act of writing is usually a one-person endeavor. A single author can shape those viewpoints into something coherent and less like a mob scene. Group dynamics being what they were, I was the newbie in the game (new character, essentially orc fodder for any random creature that might cross the group’s path), and I was probably the least assertive, least popular kid in the group. So I wasn’t allowed to say or do much. In the adjoining room to where the guys were playing D&D was a pool table. My best friend and I started playing pool and “phoning in” our responses to the game. Eventually the other guys got annoyed with us and realized we weren’t paying attention. At one point, someone called in, “Hey, I’m going to pick you up and use you for a shield!” I said, “Fine, go ahead!” My character died, I won the pool game. I consider that a fair trade. I tried the game a couple other times, once at a friend’s house, once in a gamer’s group. My brain was just not wired to work in someone else’s story. I had my own stories to tell, and they were usually set in space, not some medieval castle. Come to think of it, that also might have affected my interest in the game. There were kids at the time who got so into it that they got addicted to the experience or even killed themselves over a negative outcome in the game. My mother, a bit of a worrier, asked me about it. I reassured her that I would never get to that point because I was no good at the game. Ditto with video games. Sometimes social ineptitude and poor eye-hand coordination can be a benefit–who knew? Looking back, I can see that this was really an introvert problem. Again, storytelling was a private activity for me. It allowed me to assert myself in a way that didn’t require me to out with my peers. (Indeed, fiction was a way for me to overcome that very problem.) I got to make the decisions, tell one cohesive story, let my point of view win the day, and wasn’t being shoved around by others, verbally or otherwise. Fiction reading and writing are excellent escapes for an introvert, as they allow the individual to either concentrate on another world or create his/her own with (ideally) minimal interference. I’ve heard some of my friends say that D&D helped them with their social skills. Good for them. That was not a good social outlet for me because of the dynamics of the situation and because of the way I incorporated fiction into my life. If we had just been there to talk about Lord of the Rings, I probably would have been fine. However, when it comes to collaboration, I’m better at real-world, task-oriented activities (I at least learned that much). But please, let me tell my own geeky stories on my own.